One of the joys of having time to look through kiloware these days is that you are almost certain to find something interesting, and possibly something new. I don't have that time, but I am pleased to pass this on from somebody who does! It's the latest forgery of the 1st class gold Machin. 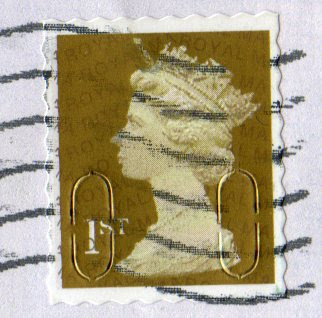 When I looked at it yesterday as an actual stamp on the piece of envelope it was clearly 'wrong' - wrong die cut, wrong screening to the head. It is also on very glossy paper, the sort of thing that might be used for labels on some retail packaging, and whilst it has the security slits, they are not right - for example the two parts to not properly line up. 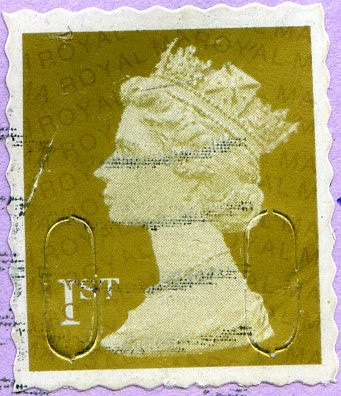 However, the scan shows something we could not see with the naked eye or magnifier, the presence of the letters that make up ROYAL MAIL - or most of them! As shown, it is really quite a crude mimic of the genuine, with incomplete words in the middle of the design, not just at the edges. There seems to be nothing on the head, and very little effort has been made to match the 'overprint' to the genuine - so little effort indeed that one wonders why the producers went to the trouble of doing it at all! If anybody can match the die-cut 'perforations' to any other label we would be interested to know; likewise if you find anything that appears to be 'wrong' we would also be interested. Many people collect postal forgeries of all periods and countries and would be interested to add one of these to their collections. So far no more than 3 of these have been found. Update - additional copies have been found with a different - but very similar - die cut. These were scanned on two different scanners, which may account for the difference in appearance of the printing. VERY Interesting. The "security" cuts look crude and the perfs look odd too. Yes why go to all that trouble. maybe it was just for "fun" not to defraud the Post Office. There have been previous forgeries with similar die-cut 'perfs'. The surprise this time is the ROYAL MAIL printing. But they get through the system - I wonder how many are unnoticed in kiloware! Very interesting update, many thanks for the breaking news. It obviously looks wrong, but that fact that it has gone through the postal system makes all the new security features look very weak. As with the people from the midlands who were jailed for the 2005 gold 1st fakes, I hope that the police (and the Post Office) take this seriously. Maybe collectors that find them can report postmark or sending locations to the Post Office / Police? It seems odd that whoever did this went to so much trouble to copy the security slits (which to a brief glance are passable) and the overprint, and yet used such an obviously wrong perforation. From the scan, at least, it is the weird "wavy" perforation that immediately makes it jump out as a fake, rather than any of the other discrepancies. Is a real perforation so difficult to fake? There's a number of hobby shop die-cut punches: one is shaped like a teddy bear, other looks like a gingerbread, and obviously one is meant to distantly resemble a postage stamp. The die-cut punches are very popular among crafters and cardmakers and they cost just a few pounds each. My guess is that who ever printed this, wanted to use an existing die-cut punch, which is inexpensive and easy to get. If the point was just to see if gets trough the system, there was probably not enough motivation to be accurate with perforations or lettering. Nor would it be cheap to buy a custom-made punch for that without making it look strange. This reminds me about the numistmatic World, where the Chinese workshops are issuing all kinds of 19th century silver coinage, but "forget" to mark them as copies, which is why a number of collectors aren't buying any old silver from unknown dealers at all. If they won't have a specific country/year/denomination available, they can make the tools for that in a week. I guess that if someone would like to buy half a million pcs of forged 1st class stamps, they would make a perfectly matching perforations for that lot quite quickly.